Join Tiffany and Tyler for a week of La Dolce Vita, which means “the sweet life”. The week will be filled with yoga, exploration, delicious food & wine and relaxation in the idyllic Tuscan countryside of Italy. Literally meaning “small village”, Il Borghino offers a secluded retreat center set in a hill top position with magnificent views overlooking forests, vineyards, olive groves and mountains in the distance. Built with wood beamed ceilings, stone, terracotta and marble – each bedroom has a gorgeous view of the Tuscan countryside. The estate is booked solely for our group of travelers and includes an outdoor salt-water pool, large communal living areas, a steam room and much more. 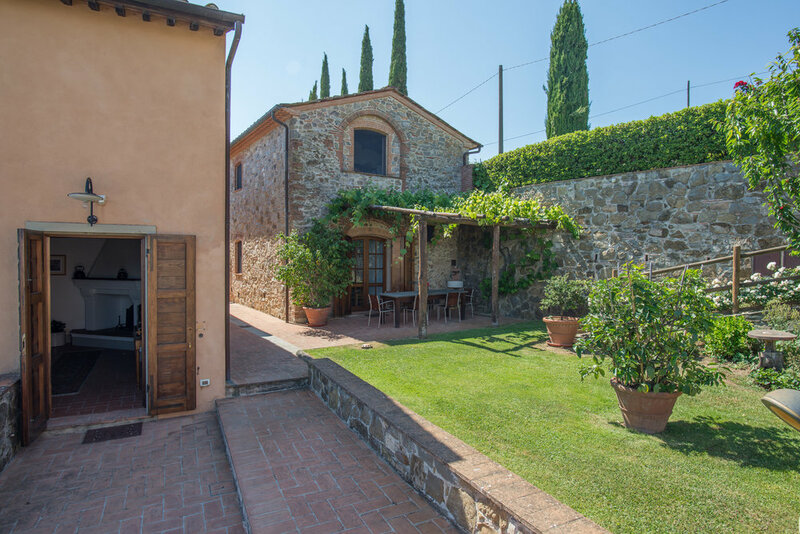 The centre is ideally located 15 minutes from Lucca, 35 minutes from Pisa, 1.5 hrs from Florence and 1.5 hrs from the breathtaking Cinque Terre region, making it the perfect base to explore Tuscany and Liguria. You will nourish mind, body & soul during this very special retreat in Italy! We will offer two yoga classes a day with the exception of Wednesday which is set aside for an all day adventure for the whole group. You can expect the morning class to be a more active vinyasa style class with alignment focused work and the afternoon class to be a more gentle, restorative & yin style class with plenty of pranayama. Together we will take in the sights with a wine tasting excursion, a bike & walking cultural tour of Lucca, and an Cinque Terre all day trip. Options for additional excursions include: a night at the opera, Tuscan cooking lessons, visit to a thermal spa and more! For our adventurers who enjoy being solo, you will have as much free-time as your heart desires to lounge by the pool, journal, and explore on your own. A $650 non-refundable deposit per person is required to reserve a space. This retreat is sold out, but we are accepting people on the waitlist so please sign up if you'd like to be notified of any spots that open up. *Please note: for shared occupancy rooms, you can let us know your roommate(s) selection or we can assign one for you.